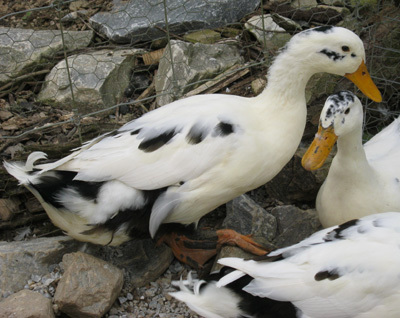 Buy Ancona Duck Hatching Eggs: Rare Breed. A critically endangered species. Great foragers, calm, fun. 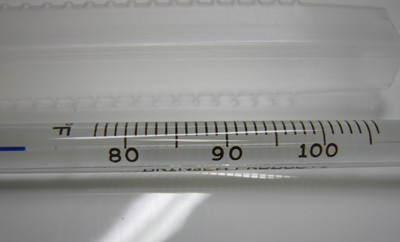 $15.90: Incubation Thermometer by Brinsea. Poultry incubation thermometer measures from 80 to 105 degrees F. Very accurate. Includes sturdy case. Shipping is $2.99. Help support this rare breed. Ducks are a lot of fun. Children and adults enjoy incubating eggs. Very educational and exciting. 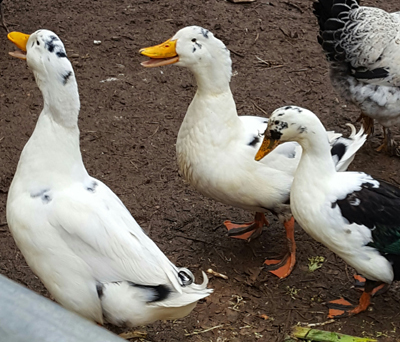 Every duckling (and duck) looks different so it is easy to identify each individual in your flock of birds. 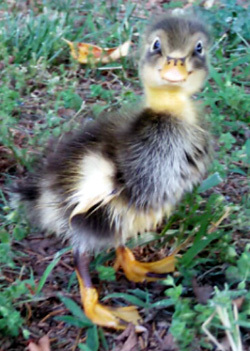 The photo of the single Ancona duckling is from Alec in Dallas, Pennsylvania. 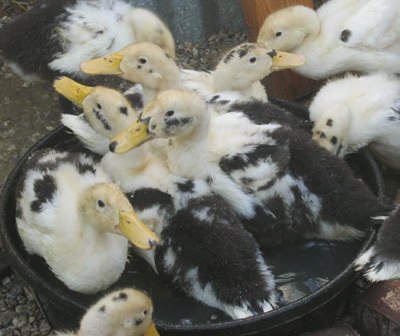 According to the American Livestock Breeds Conservancy (ALBC): "There is a critical need for more conservation breeders of Ancona ducks. 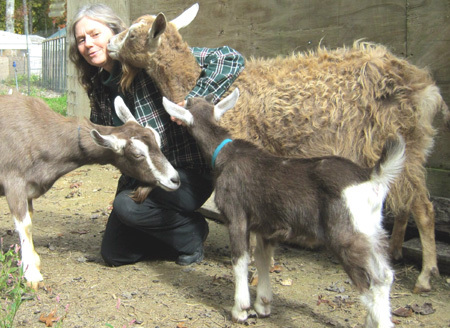 Their excellent laying ability, tasty meat, and calm dispositions make them a great addition to any small farmstead or backyard producer's flock." Be part of the preservation of an endangered species. 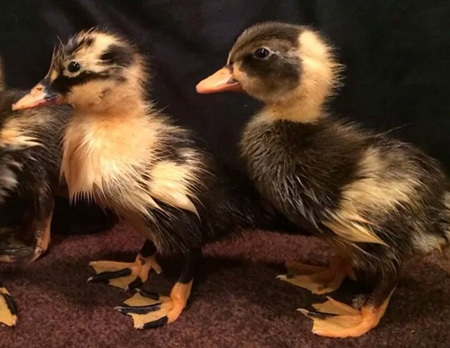 These 2 duckling photos are from Lynn Ann in Sellersville, Pennsylvania. She wrote: "We ended up hatching a total of 7 ducks. 4 that are a good split of black and yellow and 3 that are more yellow with splashes of color (2 look black and 1 looks brown). 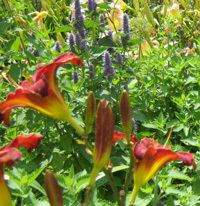 I love that since they are all so distinctly different, my girls were able to give them names." The third photo is a 4-month-old male duck. Notice his curled tail that only males have. 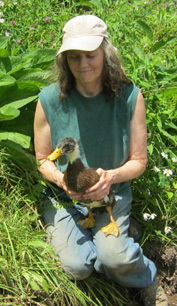 "My husband Brad and I came out to your farm and purchased duck eggs. Raising them has been a sheer delight. Most evenings, rather than sitting around the TV, my entire family will go down to the pond to watch the ducks. It has been awesome witnessing their individual personalities develop. You can email before ordering to see if I have them available. Or you can pay now, and I will email you when I can ship your eggs. 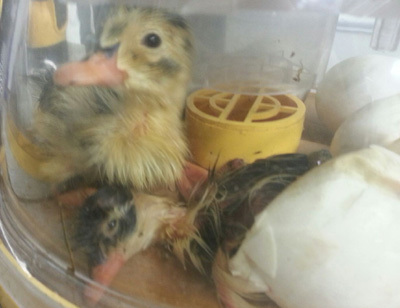 The photo with the duckling under a mamma hen is from Cynthia at Elderflower Farm in Talent, Oregon. Yes, chickens can hatch duck eggs! 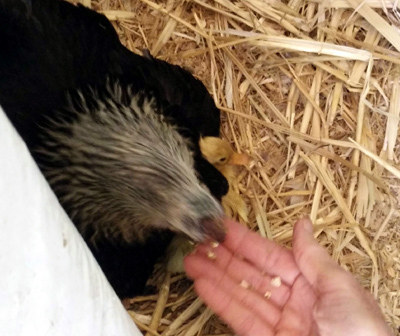 A nice video of Ancona duck eggs being put under a broody hen from Kristi in Bluffdale, Utah. Her hen is a Silver Lace Wyandotte. At first the hen does not want to be disturbed, then she sweetly tucks the eggs under her. The video is 2 minutes, 46 seconds. The end is the best. They don't have to have a pool, pond or stream but they are happier and healthier with it. They love to bathe and splash water everywhere. They are fun to watch. 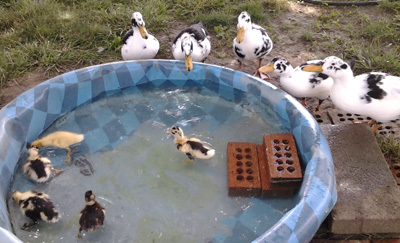 The photo of the ducklings in the pink pool is from Roger in Sellersville, Pennsylvania. The kiddie pool photo is from Tim and Jane in Kentucky. The ducks outside the pool are 6 weeks old. 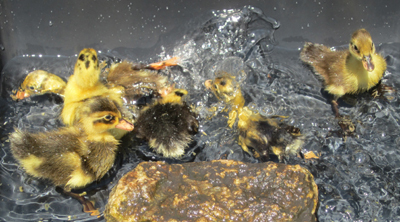 The ducklings in the pool are 1 week old. They did a good job of giving the ducklings a way out of the pool. 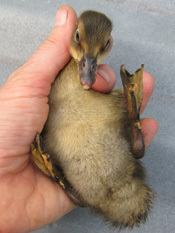 Young ducklings can drown if they get tired and can't get out. 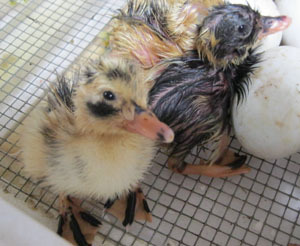 The photo of the still-wet, just-hatched duckling with eggs, and the duckling photo with pink in the background are from Roger in Sellersville, Pennsylvania. Quicktime Movie: Dominique hen with ducklings. It is 2 seconds long. She hatched these eggs! 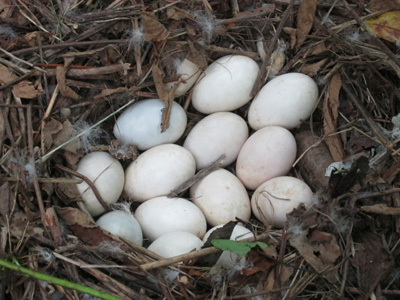 A chicken can hatch duck eggs. The movie is from Valerie in San Mateo, California. 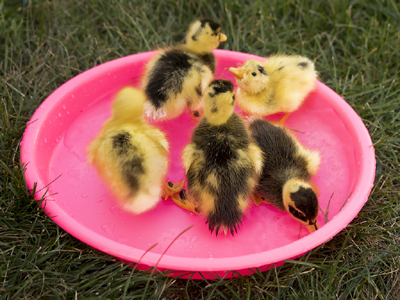 A great 22 second video of Ancona ducklings in a kiddie pool from Pam in Peculiar, Missouri. 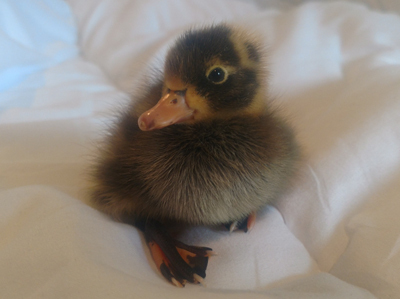 In this photo the Ancona duckling is about 1 week old. The yellow later turns to white. 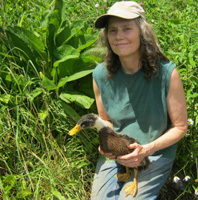 Duck care is almost the same as taking care of chickens. I have my ducks and chickens in the same coop. Ducks do not roost like chickens. They sleep on the coop floor. This breed of duck does not fly. Both eat the chicken layer feed. I add Brewers Yeast and Kelp to the feed. 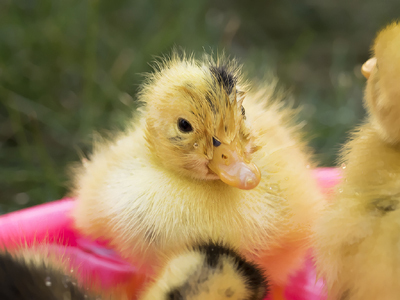 The Brewers Yeast has vitamin B3 (Niacin) that ducks need higher amounts of than chickens. Kelp has many trace minerals. 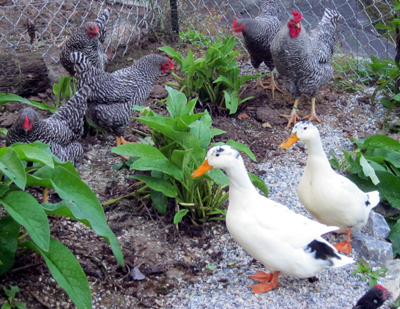 Both types of poultry like to eat almost any kind of weeds or greens. 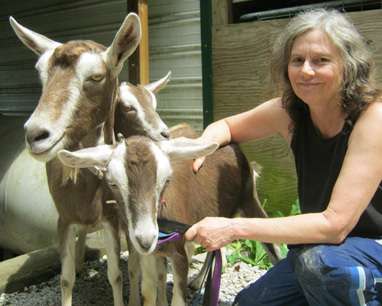 They eat that in the pasture plus I bring them comfrey leaves, weeds I pull out of the garden, and scraps from my kitchen. "I'm very excited. I raised ducks when I was growing up, and it was such a joy! I can't wait for my son to experience how lovable and funny ducks can be. They're such characters. I'm also excited to help support this rare breed. I was fascinated by all the information on your website. I'm pleased the breed has done well in Oregon. It can get cold and sometimes snow. I was happy to read this breed enjoys playing in the snow. 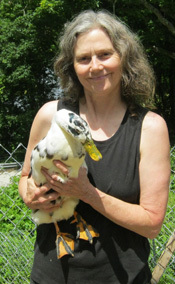 The photo to the right is Nancy with an adult male black and white Ancona duck. I love his feet. How old are your eggs when shipped? They are very fresh. They were laid either the day I ship or the day before. If you order a lot, some will be a little older while I collect them for you. But they are always less than 1 week old. Duck eggs take 28 days to hatch. You start counting the days when you put your eggs in your incubator, not when the duck laid the egg. How are they packaged for shipping? Each egg is wrapped in a tissue, and placed in an egg carton. I wrap wide scotch tape around the carton so it can not come open. I place packing material around the carton, so it is held securely. It is unusual for eggs to be broken. I have a stamp I place on all sides of the box that says: "Fragile, Hatching Eggs. Winter: Do not let freeze. Summer: Keep out of sun." Have your birds had any diseases? My chickens are very healthy. They are free range. Besides feeding them poultry layer food, I also feed them kelp, azomite, brewers yeast, sunflower seeds and flax seed. I have had friends comment on how good my birds look. Have other buyers had a good hatch rate? People who have bought in the past are happy with their hatch rate. A lot depends on the type of incubator you have, whether you have a turner (or turn properly by hand), the humidity, temperature and overall attention you give your eggs while incubating. I do enclose a flyer about incubating eggs and brooding ducklings. 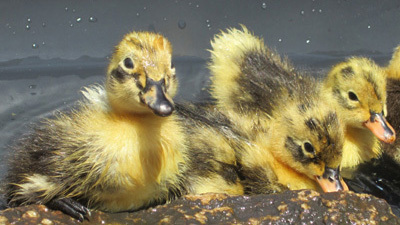 The duckling photo to the right is a 7-egg Brinsea incubator. 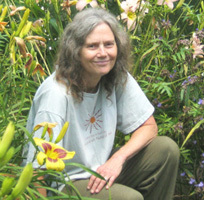 The photo is from Tim and Jane in Kentucky. You can hatch eggs with an incubator or even let a broody chicken or duck hatch them for you! 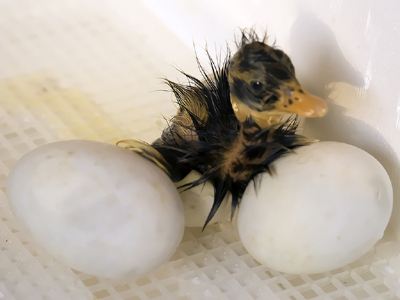 Ancona duck eggs take 28 days to hatch. Chicken eggs take 21 days to hatch. A broody female Ancona duck (hen) made this nest. Below left to right: chicken egg, duck egg, goose egg. 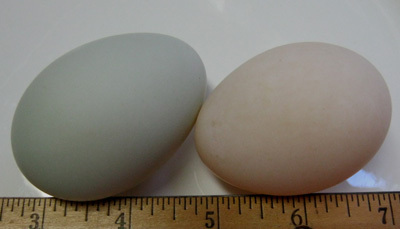 To the left: 3 Ancona duck eggs in an RCom Pro Mini incubator. This photo is from Kelli in Marble, North Carolina. To the right: Ducklings starting to come out of the egg. You can see the tip of the beak. 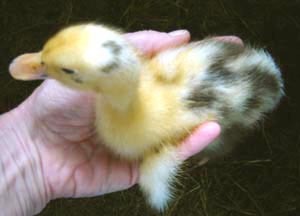 A 2-day-old Tri-Color Ancona duckling. If you want friendly ducks, spend a lot of time with them when they hatch and during the first few weeks. They will bond with you and follow you around. 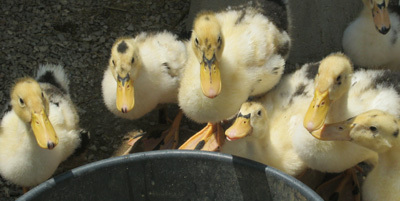 One-month old Ancona ducklings around their water bowl. 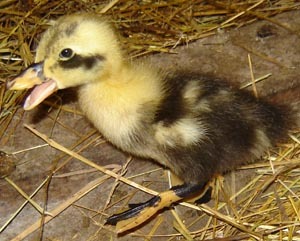 At around 5 weeks you usually can hear the difference in the quack sound between males and females. Lots of older ducklings in a kiddie pool having fun. Their feathers are changing from yellow to white. 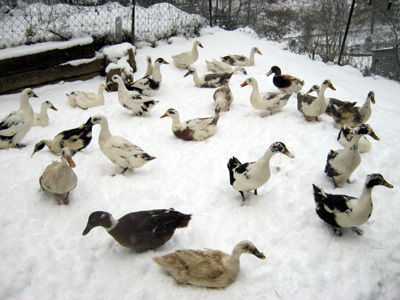 Ancona ducks come in various colors mixed with white: black, chocolate, blue, silver, lilac, lavender, and tricolor. Sometimes they have blue fawn, dusky, fawn, mallard, pencilled or other colors. Solid white is possible. Black and white is the most common. Chocolate and white is the second most common. Lavender is a deep purple-gray. Lilac is a lighter lavender. Silver is rare. 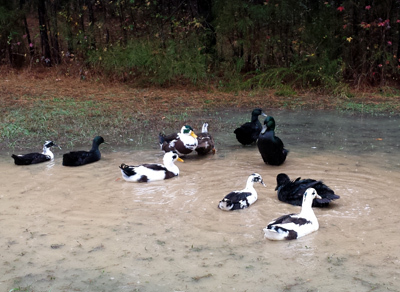 If you don't have a lake, pond or stream, you can still have ducks. Just get a kiddie pool or similar container. They love it. This drake (male duck) is having a great time. He is a Tri-Color Ancona that is dusky. His duck friends are watching. This photo is from Laura in Portland, Oregon. Yes, ducks and chickens can live together happily. 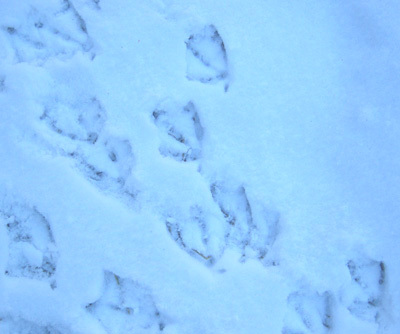 Duck footprints in the snow. Ducks like cold weather more than chickens do. Chickens and ducks can live together. 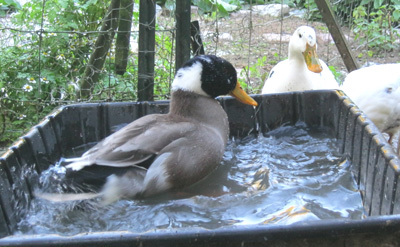 They get along well with each other, especially Ancona ducks because they are easy going. "Anconas are well suited for situations where they can forage for some of their food and are capable of eating large banana slugs. They make excellent pond or yard ducks since they tend to stay close to home, do not fly under normal conditions and are large enough so that they are less likely to be preyed upon by winged predators. Typically they have moderately calm temperaments and make fine pets."